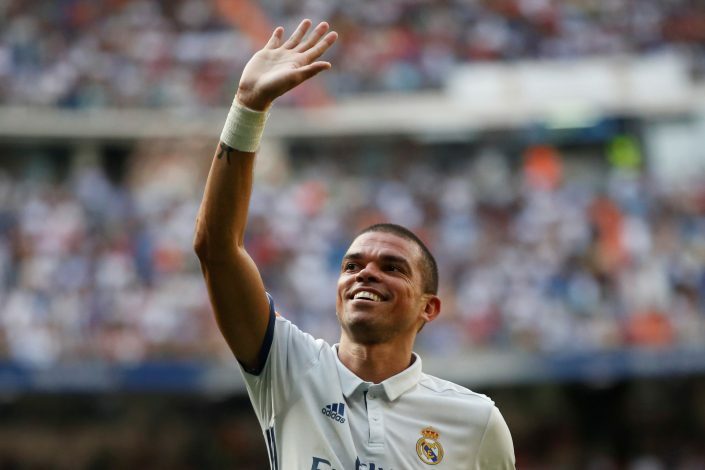 Real Madrid defender Pepe’s contract runs out in June and he had seemingly decided to head to Chinese Super League, where Hebei China Fortune are more than happy to offer him a €15m-a-season deal. Whereas Real are reportedly willing to hand him a one-year extension worth €6 million . However, the 33-year-old Portuguese is now not sure whether to take the risk, with his indecision stemming from the new rule changes regarding foreign players in Chinese football, according to The Sun. This report definitely has alerted the Old Trafford hierarchy. The highly rated defender is quite concerned as Hebei already have five foreign players, the maximum number permitted in a match-day squad, and the China clubs are only allowed to line up three foreign players in their starting eleven. If this report is to be believed then it’s good news for Manchester United in their pursuit for the Real Madrid star. Last month there were several reports claiming Jose Mourinho is hoping to land him on a free transfer. The special one worked with his compatriot during his time at Real. And now it seems a reunion could become reality for the Portuguese pair after Zinedine Zidane hinted Pepe may not be offered a new deal at the Bernabeu despite his impending China move. The Frenchman when asked about the situation said: “Pepe is an important player, and he always gives his best when he is playing. Real payed around £25 million to sign Pepe from Porto in 2007. The 33-year-old has gone on to make well over 300 appearances for the La Liga giants during a trophy-laden decade in Madrid.